With two players ranked in the top 15 in the world, the United States will be well represented for the upcoming 2012 World Chess Olympiad, scheduled to be held in Istanbul, Turkey, August 27 through September 10. The City of Saint Louis also will be well represented this year as two of the five players selected for this prestigious honor, and one of the coaches, will all call Saint Louis home this fall. 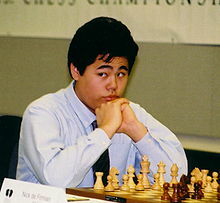 Grandmaster Hikaru Nakamura, currently ranked No. 7 in the world, is the reigning U.S. Champion and a Saint Louis resident. He will lead one of the strongest teams the U.S. has ever assembled alongside Grandmaster Gata Kamsky, a three-time U.S. Champion who is currently ranked No. 14 in the world. Grandmasters Alexander Onischuk and Varuzhan Akobian will hold down boards three and four, respectively. Grandmaster Ray Robson, 17, will fill in as the alternate for the other four players and will help them prepare each day for their upcoming competition. The players will be coached by Grandmaster Ben Finegold, the resident grandmaster at the Chess Club and Scholastic Center of Saint Louis, and Grandmaster Yury Shulman. The World Chess Olympiad is a biennial event organized by FIDE, the World Chess Organization, that pits countries from all over the world against one another in a team competition. Teams of four compete against one another, all vying to earn a gold, silver or bronze medal for their respective countries. The 2012 World Chess Olympiad in Istanbul marks the 40th installment of this event, and 166 different countries will be competing.